Emma was recently diagnosed with autism. Her mother likes the approach of Autism Outreach, but is concerned that the program is limited to ten visits and ends when Emma starts school. She’s uncertain how much help and guidance she will need, and feels pushed towards the ABA program, as it will follow children until they are adults. She likes the idea of a safety net, even if she isn’t sure the approach is right for her family. Kyle has been in ABA for almost three years. He has learned a lot of concrete skills like reading and self-care, but still doesn’t interact with teachers or peers, and he isn’t very good at coping with changes in routine. His parents are concerned about his lack of communication and social interaction. Mya is newly diagnosed with autism and about to go into kindergarten. She has trouble managing changes in her environment, and interacting with peers. As a result, she has emotional outbursts and her mother gets called by the daycare frequently to come and get her. She is also shocked to find out that her child is not eligible for either Autism Outreach or ABA, because her child is too old for their admission criteria. Jack has benefited from the first stages of a DIR/Floortime approach in Autism Outreach, but his file is closing. He is nonverbal and still has lots of growing to do. His mother wonders what therapy could provide if she could access it, and what she should be working on as Jack continues to grow. All of these children have nowhere to go for continuing therapy support in Manitoba’s publicly funded support system. Children with autism are all different. Different in personalities, in development, in strengths and weaknesses – that’s why we need flexible alternatives for children and their families. In Manitoba, if you are looking for therapy support for your child and Applied Behavioral Analysis (ABA) is not the way you want to go, the potential resources are rather sparse. Relate is an excellent Relationship Development Intervention (RDI) program with followup support. They also offer a variety of helpful seminars for both teachers and professionals. But there is less than one full time equivalent staff person, and children qualify only if they do not communicate verbally. Relate only serves people who can come to SSCY in Winnipeg. Expanding this program would serve people well. Autism Outreach’s preschool program has always offered support strategies from a variety of approaches, and in recent years there has been a strong focus on DIR/Floortime®. The autism consultants, both for Winnipeg and for other areas of the province, have at least minimal training in the approach. When therapies are offered, it’s important that they are offered in a way that is consistent with the research that showed it was effective. If you read studies about therapy, often the comparison group is receiving “eclectic” therapies – which really means whatever somebody thinks is the best thing to do, but drawing from a variety of approaches and strategies. Eclectic therapies never seem to be as effective as an approach that is followed consistently, whether that’s something like ABA, or a developmental program like PLAY Project, or the DIR-based approach used in an Ontario research project a couple of years ago. What we have in Autism Outreach is an eclectic program. Each therapist has different levels of training and expertise, time frames are short and uneven – 10 visits are all that are promised, and then parents are left to their own resources. Children change and new problems arise as they develop, and parents need to new strategies and someone to check in with as needs change. For example, “follow their lead” is meant to be the early stages of Floortime – a lot more teaching and guiding comes after that. But the program cuts off when children enter school. Autism Outreach is now in the process of training their staff in Denver Early Start – which is described as a mixture of play-based therapy and ABA. Our main concern is that if you are focused on measuring specific achievements, there is less room for open ended thinking and collaboration (see this post). Over $20,000 was spent this past year training staff in the new Denver Model, before ensuring that all staff have maintained training in DIR/Floortime. The priority is clear. 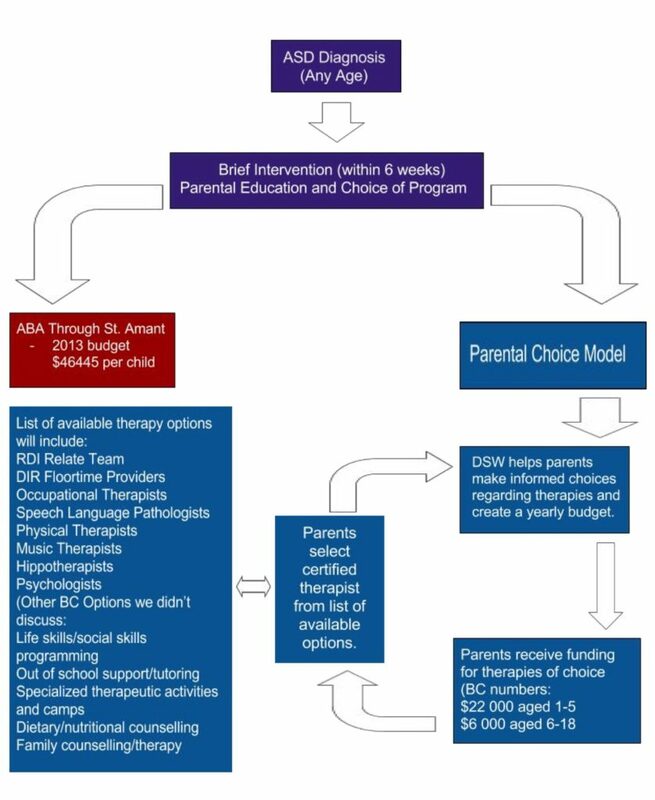 Though Autism Outreach leadership claims DIR/Floortime lacks research to support a fuller implementation, the sad reality is that the Denver Early Start Model, offered in the same 10-visit format as they have been doing with DIR/Floortime and with adaptations proposed by a researcher in Ontario has absolutely no research support. This means that Manitoba children are guinea pigs in this use of the Denver Early Start Model. This is especially sad when you realize they could be using DIR/Floortime which has dozens of studies to support it, is already being used widely in the United States as a preschool intervention, and already has the staff and infrastructure in Manitoba to make it work. Many speech and occupational therapists have training in RDI, Hanen, or DIR/Floortime-based approaches and can be hired by families. The Autism Learning Centre in Winnipeg has certified practitioners of DIR/Floortime and RDI. There are also a couple of RDI-certified practitioners in Winnipeg. This option, of course, is costly for families. Increase funding to Relate, and equip Autism Outreach to follow a research-based developmental therapy format. 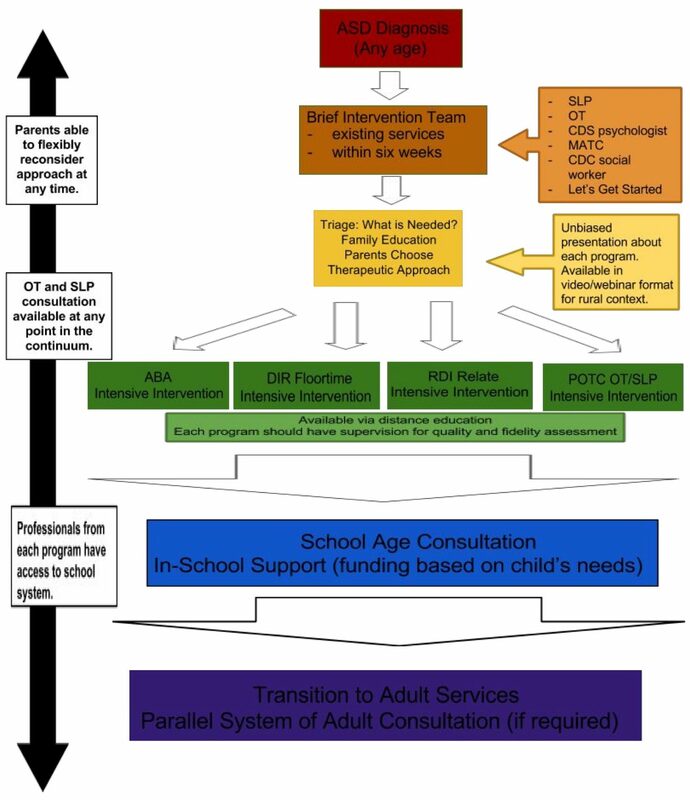 For example, PLAY Project (based on DIR/Floortime) has been implemented in many places (including the state of Ohio as their main early intervention option) using similar resources to what we already have. A PLAY Project seminar was very well received in Winnipeg a year ago, and this organization would be willing and prepared to support further training and organizational restructuring. Equip child development counselors to carry it out properly, and for longer. This option needs to also be open to families of children in school, especially children diagnosed later and whose families need to learn how they can support their child’s growth. Or, move to a family-managed funding model (like that offered in BC and now in Ontario) where parents can make choices about the best therapy package for their child. Every person with autism has a different profile of needs and strengths. Maybe speech therapy is a high priority, maybe RDI is a preference because of a family’s parenting style. This option allows a family to abandon a program that isn’t working for them to find something that’s a better fit for their current needs, and would be less wasteful of tax dollars as a result. Less would also have to be spent on organizational costs – resulting in more savings for the government. Options for autistic children and their parents in Manitoba are sparse right now, but they don’t have to stay that way. Flexible alternatives are manageable. They just require our government to listen to the parents they represent. ABA works and has the scientific studies to back it up. It is true that there is a lot of research supporting ABA. But that isn’t a helpful response for parents who have tried ABA and found it didn’t help in the ways they hoped it would, or who have ethical issues with a therapy based on compliance and external motivation, or who recognize that over reliance on direct teaching isn’t a good way to build self-advocacy, dynamic thinking, self-regulation, and collaboration.